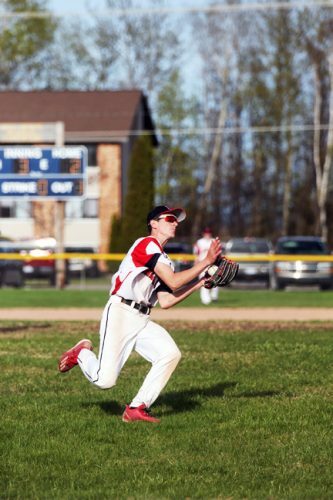 EAST LANSING — Iron Mountain waited 80 years between state finals appearances. 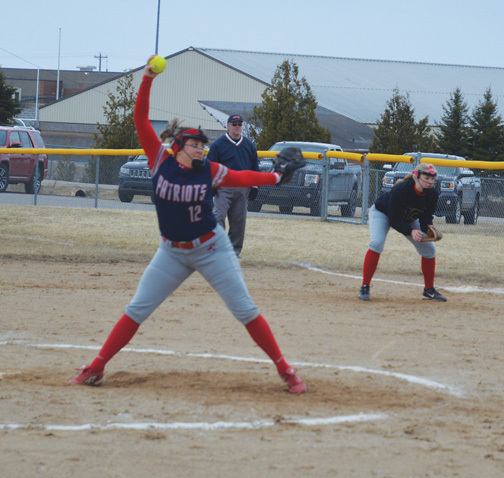 On Saturday, the Mountaineers were seven-tenths of a second away from its first state title since an Upper Peninsula-only title in 1939. 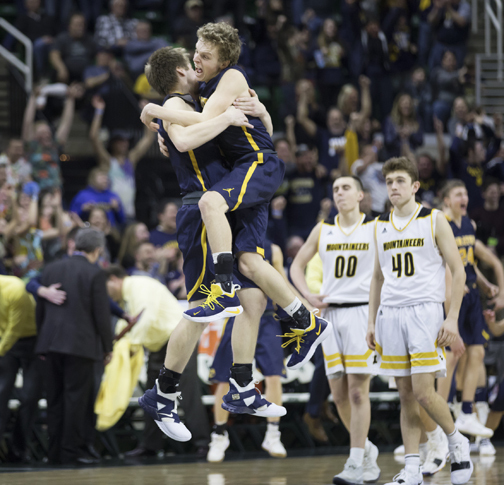 And then Pewamo-Westphalia celebrated the state championship. 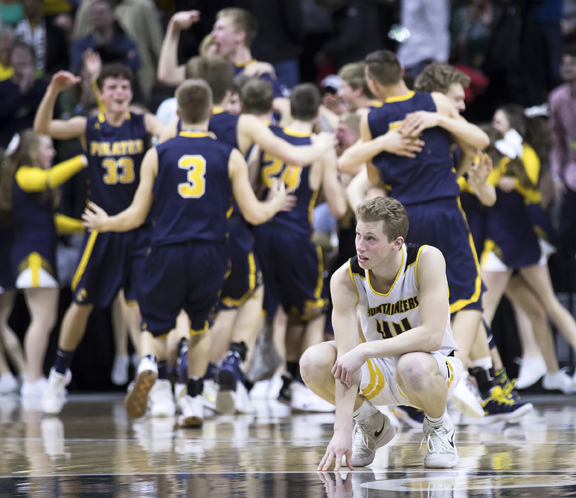 Pewamo-Westphalia’s Collin Trierweiler hit a pair of free throws after controversial intentional foul and travel calls in the waning seconds gave the Pirates a 53-52 win for their first-ever state title. Just seven-tenths of a second. After 80 years’ wait. With the Mountaineers (27-1) leading by one point, junior point guard Marcus Johnson passed the ball across the court to a wide open Tony Feira, whose layup was waved off due to a travel call with 5 seconds remaining. It could’ve all but sealed the game. Trierweiler struggled to get up court with Johnson guarding closely. Johnson shared his reaction to the game’s end. Johnson went for a foul but was called for an intentional foul, putting Trierweiler at the line with 0.7 of a second remaining. Iron Mountain took a timeout and Trierweiler made the first free throw when he got back to the line. The Mountaineers took another timeout. Trierweiler then made the go-ahead free throw. The traveling and intentional foul calls were met with fierce boos from around the arena. When asked about those calls, Johnson stared in silence at reporters for 15 to 20 seconds before responding. The game’s end drew heated reactions both in the arena and on social media. IM fans threw debris at photographers taking photos of Iron Mountain players at the bench following the team handshake. Twitter and Facebook comments demanded the final stretch of the game be replayed, or at least name the Mountaineers and Pirates co-champions. 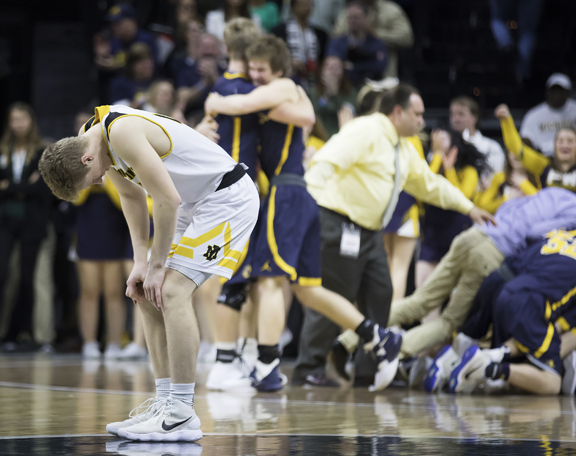 Pewamo-Westphalia head coach Luke Pohl said the ending was a tough call for Iron Mountain. 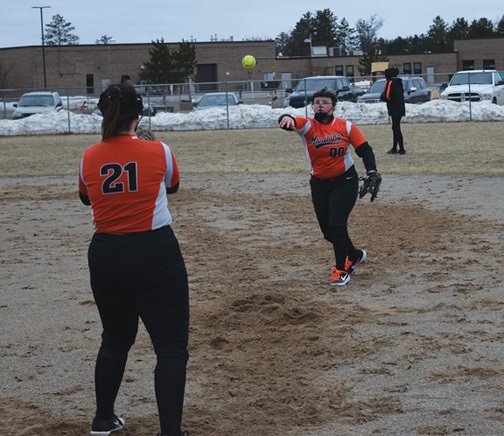 “Obviously my heart goes out for Iron Mountain,” the Pirates coach said. 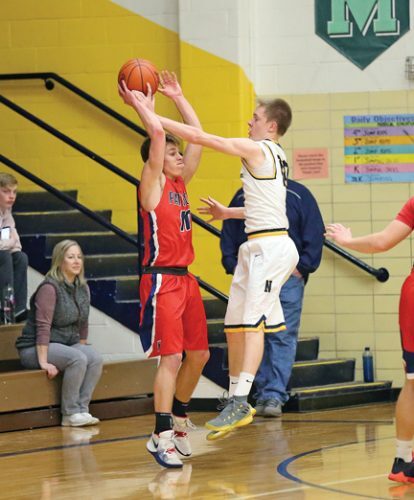 “I do know this though: I know the MHSAA has put a huge emphasis on that intentional foul. I believe if he had not wrapped his arms around Colin he would’ve gotten a layup. Iron Mountain led 52-49 with 21 seconds after a pair of free throws by Foster Wonders. Trierweiler answered with a layup to pull his team back within a point and set up the final sequence. He said it was “scary” facing the rim with the state championship on the line, but found a way to focus. Wonders, who scored his 1,000th point in the first half, finished with 20 points. Johnson had 17 and a team-high six rebounds. Trierweiler scored 15 points and grabbed eight rebounds for P-W. Teammate Andre Smith hit five 3-pointers and had a game-high 21 points. The lead changed three times, including twice in the first quarter. The Pirates led until a layup by Feira tied it with three minutes in the first quarter. A layup by senior Jaden Vicenzi with 1:52 gave Iron Mountain the lead until Trierweiler’s free throws in the game’s final second. The Mountaineers’ largest lead was eight points with 2:46 left in the second quarter. The Pirates never led by more than four in the first quarter. Smith said he knew he had to step up if the Pirates had any hopes of winning the game. He had nine points on three triples in the third quarter. Coach Johnson said the game’s emotional end will take awhile to overcome. He was asked in the postgame press conference how they’ll bounce back from it. “That’s a great question. 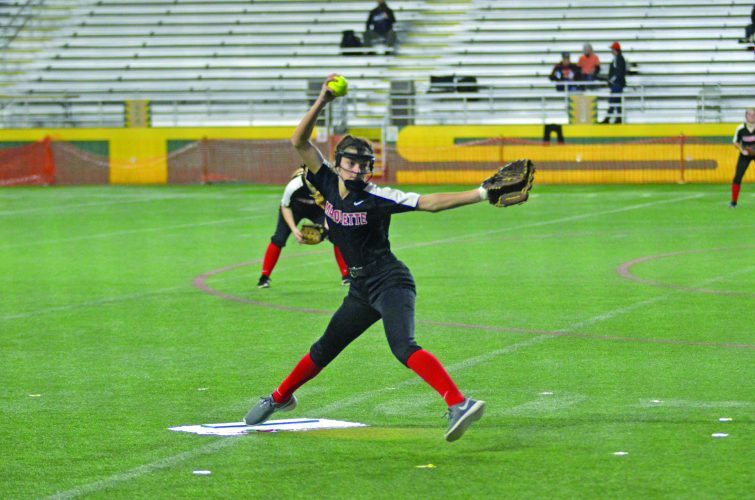 To have a state championship game come down to a play here, a play there, I respect officials,” he said. “But man, judgment is critical. You gotta forgive, I guess, I don’t know. 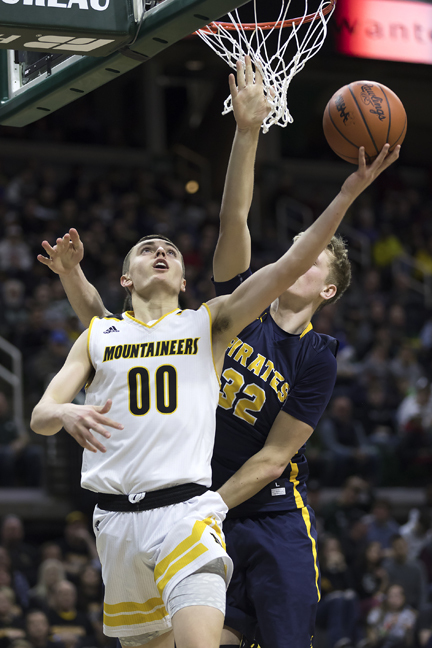 Back when they made the trip downstate before Thursday’s semifinals, the Mountaineers met with Iron Mountain native and Michigan State University head coach Tom Izzo on Wednesday evening. Izzo gave the team a tour of the Spartans’ facility and spent about an hour and a half with the team. On Thursday morning, the Mountaineers sat in on a Spartans practice at the Breslin Center before MSU departed for Chicago to play in the Big Ten tournament on Friday. Izzo left his alma mater with some advice before leaving.